If you have been looking into the popular online fitness brands Kinobody and Athlean X and now consider whose program would be the better fit for you, then you are in the right place! First of all, it should be said that a very large number of people have had success with following either and that both brands have great programs. I feel very confident in saying that you too can have success and get in great shape with both. But I also feel confident in saying that depending on your specific goals or preferences there is definitely a “better choice” for you. As you may or may not know both Kinobody and Athlean X sell a variety of programs made for people with different fitness level and/or goal. Who Is Greg O’Gallagher (Kinobody)? Of course, Greg has an impressive number of so much other great content on Youtube and his first video actually goes all the way back to 2009. Like most big YouTubers, Greg has had his fair share of criticism from both viewers and other YouTubers alike. You probably don’t have to spend a long time in the comments section to his videos before you find something hateful written. He was even called the douchiest fitness celebrity by the online magazine Vice, which is an impression that perhaps is understandable from his older video content, but nonetheless not true at all. I believe this “douchebag impression” was a byproduct of an earlier marketing approach which I talk more about here. However, for every video that might give you that impression, there is like 50x more videos that clearly shows that Greg is sharing great fitness knowledge and is passionate about helping people. Take a look for yourself on his Youtube Channel. On the surface, the main idea of the Kinobody programs is dead simple – to get a strong and aesthetically-looking body like you see main character / important characters have in popular Hollywood movies. Just think of any cool movie about superheroes or secret agents and you get the idea. However, the message that is sometimes overlooked is that the pursuit of becoming lean and muscular – or just looking great naked – is much more about becoming confident in yourself and seeing yourself as the superhero in your own life journey, and eat and do what you want to, not spending long hours in the gym or eat prepacked meals from a Tupperware box. Because of that, all the Kinobody programs take a minimalistic approach to training and nutrition. This is done by combining intermittent fasting and only working out three times per week with the main focus on lifting heavy with few reps and exercises (low volume). Each session taking somewhere around 45 minutes – 1 hour and 15 minutes to complete. You can read more about “volume” and other weight training concepts in my beginner’s guide here. This is not just some weak marketing fluff Greg uses to sell his programs, but it is actually a reflection of his own fitness journey. The Greek God Program is arguably the most popular program from Kinobody. It is a lean-bulking program for heavy weight training beginners to intermediates. The main focus is getting strong on a few heavy weight training exercises and building proportionate amount of muscle in order to get an impressive-looking physique that resembles the one of a Greek God. This is a lean, muscular and sleek body. Big squared-chest, broad shoulders and a slimmer waist (V-taper). It is not as bulky as a bodybuilder. The program is divided into different phases which you will be going through as you progress along. The majority of the time you will be focusing on getting stronger using a reverse pyramid lifting scheme that is lifting your heaviest set first with fewer reps following by decreasing the weight and increasing the reps each set. Cardio in the form of walking is optional but not a requirement. If you insist on doing HIIT the program recommends you limit it! The suggested minimum timeframe for following the program is 6-12 months, although it also comes with additional workouts that could be preferable after doing the main program for 12 months. You can check out my full review of the program here where I also reveal how you can save 20 bucks and get it the program for 49 $. Who Is Jeff Cavaliere (Athlean X)? Jeff is a physical therapist and strength coach. He is involved with training various pro athletes in different sports disciplines, especially baseball. You don’t have to watch many of his videos to understand that this guy is clearly very knowledgeable in human anatomy and biomechanical movement. Most notable is perhaps when he draws out his marker pens and draws lines along the muscle to demonstrate and visualize how it moves and contracts when used. Jeff has like Greg been around YouTube for a very long time. Actually, his first video also goes back to 2009. But when comparing the number of subscribers, Jeff is in a completely other league. To be honest with you, Jeff has been crushing it on youtube in recent years and at the time of writing, he has 6.4 million YouTube subscribers. In my opinion, it is for a good reason. He rarely holds anything back at all when sharing his knowledge and gives incredibly helpful advice on anything related to fitness in his videos. Similar to Greg, Jeff has also received his fair amount of criticism, although it is mostly outside of youtube. Especially on the forum bodybuilding.com, you will find people criticizing him for his “gimmicky” marketing (use of “X” and the looks of his website) and his sub-par programs not focusing enough on gaining strength and muscle. However, the strength and muscle building part is a poor criticism since the idea of the programs is not only to build muscle but to gain strength, endurance and the capability to use muscles freely in all planes of motion to increase athleticism as well. “train like an athlete to look like an athlete”. The literal meaning is clear, that if you want a great-looking, strong and healthy body like an athlete, then you have to train the same way that they do. However, what I also think it implies is that being athletic and having an overall functional body including strong and healthy joints, good body posture, balanced muscular development is the top priority. Being “shredded and aesthetic” is the byproduct of that or in other words is a lesser priority. This might not be super obvious from just reading those words, but after watching many of his videos I think you can agree with me. This is also clear in his programs which are not designed strictly for gaining muscle (some more than others). I believe all of his programs are meant to be followed for 90-days and require you to train 5 times per week. Usually, 3 of those sessions are longer and focused on strength and endurance while the 2 others are shorter and for conditioning. This fact does affect muscle growth negatively, which is a reason for some of his criticism mentioned above. The programs are sold with a 120-day access or lifetime access at a relatively small extra fee. The max size program is as the name implies focused on making you gain the maximum amount of muscle. The program focuses on the “classic” heavy lifts like bench press, squats, and deadlifts, but unlike the Greek god program mostly uses a lot of reps and set (high volume). Consequently, the weights you will be lifting have to be lighter than if you follow the Greek God program. The max size program is probably not the most popular program from Athlean X. I would assume it is the beginner to intermediate program AX1 – Training camp, but that program is about burning fat and building muscle at the same time, which you can’t compare to the Greek god program very well. The Kinobody alternative to AX1 would be warrior shredding, which you can read about here. 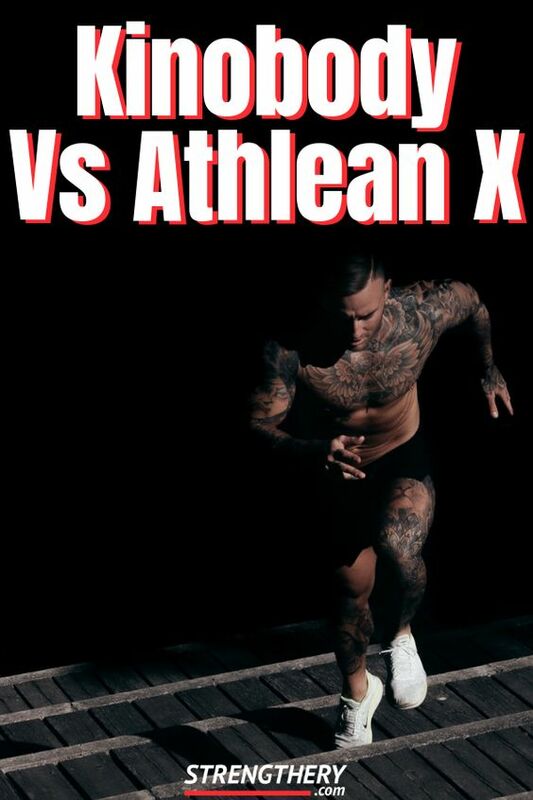 Should You Choose Kinobody or Athlean X? This makes the programs excellent for beginners or people who just want something that “works” instead of relying on free programs that might or might not disappoint. However, if you are a complete beginner it is probably better to have someone more experienced help you out in the beginning. That is always the case with online fitness programs though. By the way, the programs also come with a money back guarantee. So if you don’t feel they live up to their word, you can get the money back. Kinobody or Athlean X, that is the question! In a nutshell, the Kinobody programs are for people who want to become very strong with low-volume heavy weight training spending less time in the gym and get a jaw-dropping physique like their favorite Hollywood actor. Athlean X on the other hand, are for people who care more about athleticism, joint flexibility, and functionality at the cost of a slower progress towards looking awesome. In other words, Athlean X is not the best choice if you are looking to maximize aesthetic looks. If you have a history of injuries in the back and/or shoulders, it could be better to choose an Athlean x program since they have many scaling options and don’t require you to work as heavy weights. Personally, I prefer the Kinobody programs because I like low volume heavy weight training more than anything else. I also very much like the simplicity that intermittent fasting brings to the “eating portion of my life” (pun intended). I have found that my body responds very well to this combination, probably better than anything else. You can learn more about how I view nutrition in my free nutrition guide titled “The Awesome Nutrition Guide” here. By the way, I have done a lot of different training so I think I have enough experience to say this. To ensure healthy joints and mobility I stretch and do a few short yoga sessions of about 20-30 minutes each week. I would not be able to call this a real comparison without taking a look at the pricing, and here Kinobody is doing much better! Assuming you get the course for 49 $ (using the discount I mention in my review) that is a big difference to the 77 $ (120 limited access) or 97 dollars for lifetime access. Not that I think Jeff doesn’t deserve that money with all that great value he shares for free on his Youtube channel, but I don’t like his pricing mechanism. I don’t feel it makes much sense other than being a subtle way of pushing people into buy in at the more expensive package, because who would want a 120-day limited access? The Kinobody programs are lifetime access including updates and revisions which have happened several times until now. Nice write up Marcus. I did the Kinobody Warrior program about 4 to 5 years ago. Solid stuff and more focused on eating at a caloric deficit. I also have been training using AX-1, 2, Ultimate Arms, Xero, and recently Beaxst from Athlean-X. Jeff doesn’t focus on intermittent fasting nor does he believe in calorie counting… I like both brands and although I like the idea of getting results with minimal effort, I’m in my 40’s now and value function over asthetics any day, so I mostly stick to Athlean style workouts.